Would You Eat a Plate of Roadkill? We have all seen deceased animals at the side of the road from time to time. Maybe you have even said a silent prayer for one or two of these victims of traffic accidents. However, have you ever thought about eating one of them? The new president of the RSPB is called Miranda Krestovnikoff, and she has said that more of us us should give the supermarket the cold shoulder and shop on the hard shoulder instead. Her unusual comments came after she threw a dinner which included such roadkill classics as fox sautéed in garlic, badger chasseur and fried rat. It seems that the A354 and the B3347 are good places to grab some fresh meat. Krestovnikoff said that this kind of meat is “as fresh as fresh can be”. She also claimed that it was a way to “get connected” to what goes on your plate. She said that her culinary roadkill days began when she found a lifeless partridge outside her house and set about turning it into a meal. She and her husband apparently have a tarpaulin sheet in their car where they load the remains of any dead animals they find. She says that she doesn’t actively look for roadkill but that she is quite comfortable feeding it to her family. If you decide to try out this type of meat then big beasts like deer need to be hung up in a dry place for about 5 days. You can even take the animal to a butcher if you don’t fancy doing the dirty work yourself. Of course, you don’t want an animal which has been there for too long or which has been completely flattened. 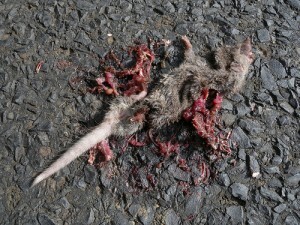 On the other hand, the Food Standards Agency says that eating roadkill is not advisable. However, it is legal as long as you don’t sell the meat or knock down some poor creatures on purpose. What’s the biggest piece of roadkill you ever saw? Would you have eaten it with some chips and a nice sauce? Would You Be Interested in Seeing an Unusual Car Museum At All? What vehicles or animals could your car beat in a race?